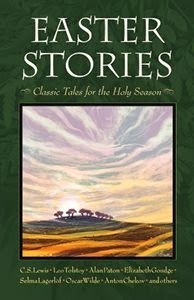 Easter Stories: Classic Tales for the Holy Season is a collection of classic stories, ideal for reading aloud during the Easter season, compiled by Miriam Le Blanc and illustrated by Lisa Toth. Authors include C. S. Lewis, Leo Tolstoy, Oscar Wilde, Anton Chekhov, Alan Paton, Ruth Sawyer, The Brothers Grimm, and more, and each story is accompanied by a woodcut print. During the season leading up to Easter, it is nice to have a resource that helps us meditate on the true meaning of the season. Bunnies, Easter eggs, and baskets of treats are fun, but we should also remember the reason we celebrate Easter in the first place. Sharing stories like the selections in Easter Stories in our family is a great way to focus on the spiritual side of Easter. Somebody brought him a piece of fried fish. He took it and ate it right there in front of them. He said to them, 'All this is what I was talking about while I was still with you--how everything written about me in the law of Moses and in the Prophets and Psalms had to take place'" (p. 52). Similar is style to Home for Christmas, the stories in Easter Stories: Classic Tales for the Holy Season are just the right length to read in one or two sittings, especially as a read aloud for older kids. My kids anticipate the fun each year as we plan to spend time with family and hunt eggs in the yard, and Easter is a favorite holiday in my home. Easter Stories is adding another dimension to our Easter season by providing material we are spending time reflecting on. I like the fact that these stories are of high literary quality, and I have incorporated this book into our homeschool literature curriculum for the spring. The publisher provided a review copy for my honest opinions. Learn more here.